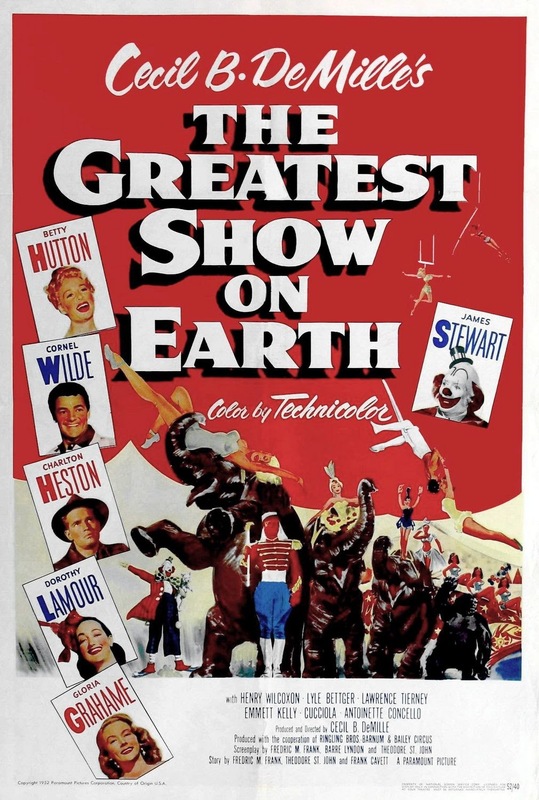 Movie: "The Greatest Show On Earth"
A struggling circus, determined to stay in the black, signs a new headlining act known as The Great Sebastian (Cornel Wilde). Sebastian is a bit of a ladies man and starts to cause drama behind the scenes with former headliner Holly (Betty Hutton). The head of the circus Brad (Charlton Heston) has to do his best to keep things running smoothly so the show can always go on. Have you ever wanted to know how the circus is run?....no?... neither did we, but you will certainly get a detailed look into the day to day lives of circus folk in "The Greatest Show on Earth." How good the movie is depends directly on your love of it and/or how badly you want to acquire knowledge of the goings-on of a circus with an emphasis of the behind the scenes. Sure, there are acrobatics and animals, but most of this movie focuses on the drama behind the scenes and it's mostly boring as hell. A voice-over tells how the people involved load and unload animals on a train and how they roll out the big top, as well as how they drive spikes into the ground. This voice-over drones on and on about the ins and outs of the circus ad nauseum as if someone in 1950 asked "please tell us in very slow, boring detail every single thing that happens at a circus!" and then Cecil B. DeMille proceeded to make a 2 hour and 32 minute long movie about it...oh wait, that's exactly what happened! Really, when you think about it, the opening sequence of "Dumbo" shows the same thing except in much less time and in a much more entertaining manner. Sure, there is a minor story in this film that mainly revolves around the love triangle between Sebastian, Brad and Holly, as well as a small professional rivalry between Sebastian and Holly, which helps kindle the aforementioned romance. Beyond this romance, there is a little mystery about the past of a clown named Buttons, played by Jimmy Stewart, which gets brought up every hour or so in an effort to keep this drudgery interesting. There is also a brief but major plot point about Brad and a scuffle with a small-time criminal who wants to hustle people on the circus midway. Apart from these three or so things, the rest of the film's run time is filled with circus acts: clowns tumbling, trapeze artists, animal tamers, little people, big people, etc. The director could have easily cut at least 45 minutes to an hour out of the film and would have been able to tell the same story just as effectively, if not more so. But, determined to make this movie his way, DeMille wanted to put the circus element at center stage (pun intended). What we are left after his artistic vision is said and done is a 150 minute over-bloated commercial spectacle and product placement for Ringling Bros. Barnum and Bailey rather than an actual interesting and enthralling film. The biggest slap in the face to the viewer is that this spectacle managed to win Best Picture! This leaves us wondering, nay, knowing that it was because of its sheer grandeur because it certainly doesn't hold up very well today, especially with the many controversies about the circus that have come to light since the time that this film was made.